Lentils. They’re the forgotten step-child of the legume world. In the supermarket you typically find them available dried, in one of those sad looking plastic bags, on the very bottom shelf. You have to look past all those shiny cans of black beans and garbanzo’s. Even the split peas are more enticing, with their cheerful bright green color. Nobody thinks about those poor lentils. They’re like that dowdy girl everyone knew in high school. The one with the glasses and the enormous saxophone case. No one realized she’d grow up to be a gorgeous, globe trotting rock star. Yeah. Lentils are a lot like that. Cheap and boring to look at. But once you get them out of the bag and into a pot….once you give them a little makeover by rinsing them and picking out any bits and mixing them with a saute of onions and carrots and celery. Wow. Those lentils are something! In fact, I can distinctly remember the very first time I tried lentils. It was my very first time flying overseas. I flew Air France, arguably the best foodie airline EVER, what with the free wine and fresh baked baguettes and cheeses. When they served the incredible lunch it included a cold lentil salad. Being a college-aged kid from the midwest at the time my gastronomic experiences were pretty limited so this salad was a REVELATION. Lentils were a revelation. Not only a tasty revelation but…they’re so cheap! They’re full of protein and fiber and all those good things we should all be eating lots of. You can keep a few bags squirreled away in your cupboard forever and, unlike dried beans, they don’t require soaking. Lentils rock. The funny part is…kids get it. They GET the lentil. Unlike lettuces and other suspicious veggies, lentils are typically an easy sell and they’re also great for mixing with other veggies. When I tell Lillian we’re making lentil soup she is all over it. She will eat BOWLS of this stuff. So its become a go-to weeknight recipe for us. I try to keep several bags of lentils stashed in my cupboard, “just in case.” The soup recipe below is incredibly adaptable….if you’ve got chicken broth, throw it in. If not, use water. You don’t have carrots? No biggie. Just up your celery quotient. Want to throw in a handful of kale? Excellent idea! Even though this is a hearty soup it’s still light enough for a summertime dinner, especially when served alongside a loaf of crusty bread and a crisp garden salad. In fact, the next time I make it I think I might try doing it in the slow cooker so I can avoid turning on the oven in the summertime heat. If it works out, I’ll post an update. 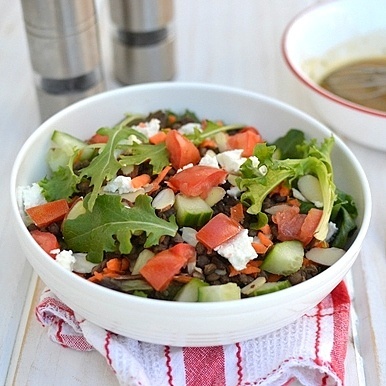 Do you have any favorite lentil recipes? Share them with us! Rebecca Andexler is a freelance public relations and culinary consultant who does her best work during naptime. Her culinary experience includes a personal chef and catering certification through the culinary arts program at Kendall College, Chicago, IL as well as a nightly gig cooking meals for her husband and their opinionated toddler. When she’s not fielding media requests, testing kitchen gadgets and developing new recipes for clients, Rebecca and her family enjoy cooking and baking together, visiting the farmer’s market and discovering new restaurants. She maintains a food and parenting blog at www.homemakershabitat.com. Heat oil in heavy large saucepan or Dutch oven over medium–high heat. Add bacon, onions, celery, carrots, and garlic; sauté until vegetables begin to brown, about 15 minutes. Add 4 cups broth, water, lentils and tomatoes with juice and bring to boil. Reduce heat to medium–low, cover and simmer until lentils are tender, about 35 minutes. Puree soup with a stick blender to develop a smoother consistency (some texture should remain). Alternately, transfer 2 cups soup (mostly solids) to an upright blender and puree until smooth. Return puree to soup in pan; thin soup with more water by 1/4 cupfuls, if too thick. Gently stir in butter until melted and fully incorporated. Season with salt, pepper. Ladle soup into bowls to serve. Did u cook the lentil soup in the slow cooker. Hiw long…how much water…did they turn out ok? Hi Brandy! Thanks for asking. Actually, I haven’t gotten around to trying the slow cooker method on this one although now that the fall weather has arrived I think I’ll need to give it a shot. I’ll probably try it on a weekend just so I can watch and and start off with roughly half the water as the “regular version”, on the low setting for 6 to 8 hours. But I’ll plan to check it every 3 hours to see if it needs more water or any other adjustments. I’ll let you know how it comes out! Thanks for your comment. Thanks for the recipe. I am trying to use more Lentils. Both because they are good for you and because of the cost. But having an eight year old in the house I worry she wont like it. I am trying your recipe tonight! I am not one to post on the Internet or leave a reply…but my very picky six year old son really liked this! He ate the leftovers and liked it months later when I made it again. Thanks!